I remember looking over my fertility chart feeling queasy as I wondered… Could I really be pregnant again? It was the first time we had tried to conceive after the last miscarriage just a few months before. I was only 10 days past ovulation, there was no way I could be feeling sick already. I thought, its all in my head, its just not logical to have symptoms this early. But alas I could not wait, a few minutes later I watched a faint pink line stretch across the window, confirming what I had hoped for all along. I was pregnant! Suddenly a pang of terror ran through me. Would this child live? Two others had succumbed to the darkness of my body, denied the breath of life. There was no reason that this one should live either, sadness and woe filled my heart. I clung to the little hope I had left in my heart and I prayed that God would have mercy on me. We made the hour long car drive to Lafayette from Baton Rouge where our birth team was waiting for us. They had the birth tub full of hot water and I could not have been more anxious to dive in. The warm water felt strange and almost foreign as every nerve in my body ignited with each rolling wave. I felt light and suspended, as if I could float away. As my pain grew, I became acutely aware that my sons arrival was approaching. I made my way to the toilet where I regained some control over the pain and myself. At once, a shadow of fear fell over me. I went from total confidence in my body to sheer disbelief. I told my doula, “I don’t know about all this” she asked me what I meant in which I replied, “I’m just not sure, maybe I should be in the hospital.” She looked at me tenderly and said exactly what I needed to hear, “everything you need is right here, everything you wanted to happen is happening right now and your baby is coming soon.” In that moment I realized that unlike those other babies lost, I would soon be holding my very own son in my arms. Not a minute later I felt him push down hard inside me. This was it, no turning back, no room for doubt. This baby was coming out. I stumbled across the room from the toilet to the bed and asked for the midwife to come in. She came in and asked if I was feeling pushy and with a nod I lowered myself to the bed for her to check me. Laying across that mattress became my personal hell for what seemed like ages as another violent wave crashed down on me. I felt as if my body might dismember itself right then and there. She assured me I was complete and asked if I was ready to push my baby out. “Yes” I cried out. I stood and felt him push down with such force that I felt he would fall out and on to the floor below. I felt a warm gush of liquid flow down my legs and splash at my feet. My bag of amniotic fluid had finally ruptured. I rushed the 4 feet from the bedside to the birthing tub. I knew that if I didn’t get into the water right then, my dreams of a water birth would not come to fruition. The next and almost final wave brought my sons head down through the canal, the pressure was unbelievably strong. And then I felt it… a searing hot fire leaving my body and I remembered Hannah telling me “when you feel the ring of fire, that’s when the baby’s head is coming out.” Suddenly someone shouted “slow down, pant like a dog!” But I could not pant, I could not even remember what it would be to pant. After all, my brains were in my bottom just like Ina May had said. Yes, something primal took over me, that searing hot fire urged me to dig deeper, push harder and then, he left my body. Almost totally in one fluid motion he passed from womb, to water, to earth. Jackson Lynn Iverson took his first breath and then I heard his first cry. Instead of pain washing over me it was a wave of relief. Total relief and utter bliss flooded my soul. I turned over in the tub and took my living, breathing son in my arms. “Oh my God, I have a baby” I gasped. Surreal is the only appropriate way to describe the moment… He is my rainbow. My beauty & light after the flood of sorrow that could no longer hold a place in my life. Jackson just turned a year old on October 14th and is of course still nursing. I really do not mind the fact that he is still nursing but I decided that I would really like to sleep more than 2-3 hours at a time at night. Good nights, he would wake to nurse 2-3 times, bad nights Brad and I were up 6+ times. Exhaustion had ruled my life for far too long. Starting last friday, I started sending Brad in to Jackson every time he woke up. He would give him a drink of water, pat his back, give kisses and hugs and then leave the room. There was a fair amount of anger and rage emitting from his room that night. He wanted nothing to do with Brad. I felt bad but I really needed rest, real rest. I had done nothing but nurse him for an entire year and it was time. I felt Jackson was finally mature enough to understand that I was just in the next room and that he was okay. Night two, he only woke up ONCE! And not until 4:30 ish in the morning. Success! Night three, he also only woke up ONCE! and not until 6:45 am! BOOYAH! He has yet to sleep until 8:30 straight through but I am way okay with that. I have gotten more rest in the last few nights, than I have in the last year and it is pretty great indeed! Every morning around 8:30 I go into his room and get him once he awakens for the day. We then return to my bed for snuggles and nursing. He is so happy to see me and I am just as happy to see him! 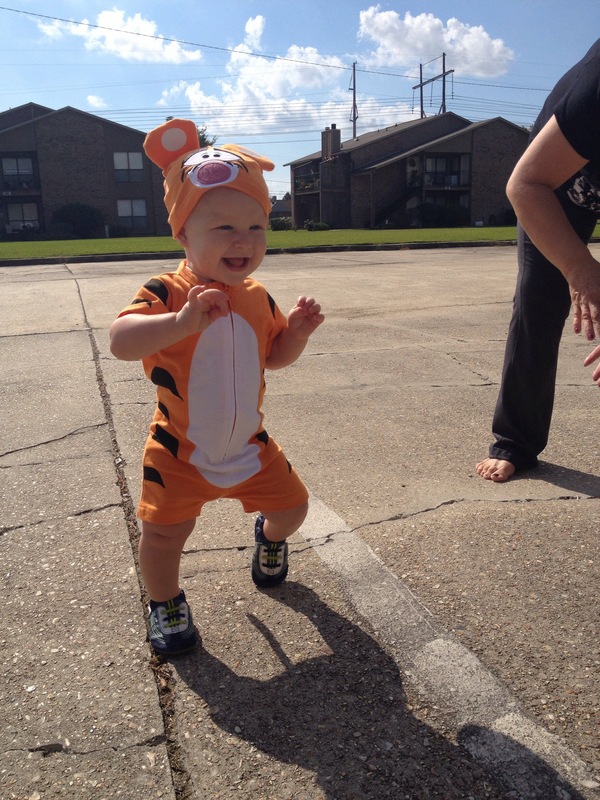 Hes almost 13 months, we did not rush “sleep training” or whatever you want to call it. I think each child should be considered as an individual and not shoved into a cookie cutter moulding of what they “should do at ___ age”. I waited for the right timing and it was a smooth transition. Mommy Necklaces Review & Giveaway!!! Congratulations! I will contact you shortly with the coupon information and instructions. A few months ago, I published a review for Mommy Necklaces and this week, the new owner contacted me. She offered 2 $10 off coupons to give away here on the blog. -You must like Mommy Necklaces on Facebook by clicking here. -You must comment below stating that you would like to win the $10 coupon & that you have completed the above requirement. Drawing will be held and announced on September 11, 2013- entries after September 10th will not be included. This is Jack enjoying my mommy necklace while nursing on our way to Salt Lake City. If you have never heard of Mommy Necklaces, check out my review below and make sure to visit the Mommy Necklace website by clicking here. A necklace made with non-toxic beads, and a safety clasp for Mothers to wear with young children. The reason that I personally purchased a Mommy necklace is because Jack was doing too much damage. And by damage I mean digging and pinching with his fingernails into my neck and chest, many times breaking the skin. It hurt no matter how often I clipped his nails. Plus when he would nurse, he liked to put his hand in my mouth and hang his fingers from by bottom teeth! Disgusting! I needed something to keep his busy little hands occupied. I purchased my necklace from Angel Britches locally here in Baton Rouge. It came with two donut rings that make a rattling noise when Jack shakes the necklace. He really enjoys it when I remember to wear it! It has pretty colors blue, green, red and orange and seems to match almost everything I wear. It’s not a teething necklace but I don’t worry about him biting it once in a while since the beads are non-toxic. I would rate the Mommy Necklace a 5/5. To visit the Mommy Necklaces web page Click here! Today’s post isn’t exactly a recipe, it’s more of a tip or trick to easy gluten free brown gravy! Put your potatoes in a sauce pan or small pot and cover them in the bone broth, add the 1/2 cups if necessary to cover the potatoes in liquid. 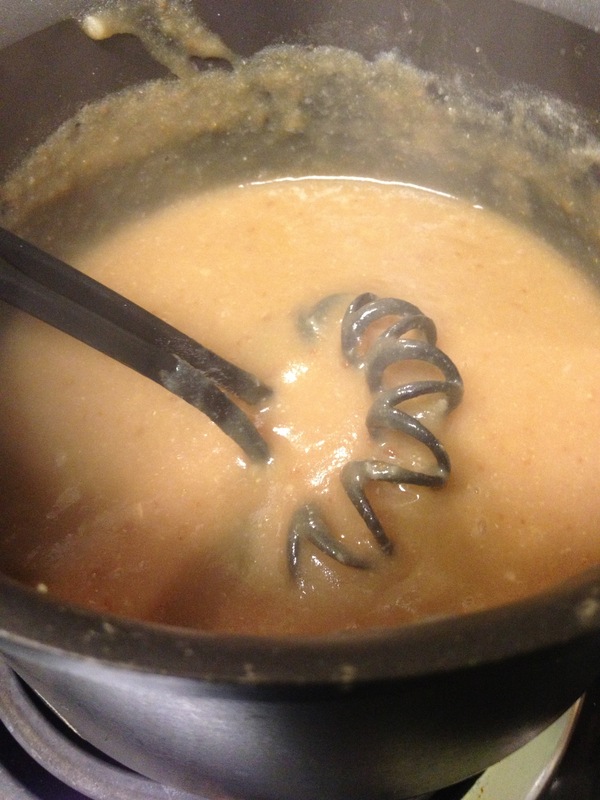 Be careful not to add an excessive amount of water, or it will yield a thin gravy. Add a sprinkle of salt. Remove potatoes from liquid and place in a bowl, add butter, salt and pepper and smash into mashed potatoes or whip with mixer if you prefer. Observe your broth, it should be thick now. The starch from the potatoes will have turned it into gravy! Taste! Season with salt and pepper or anything else you like! 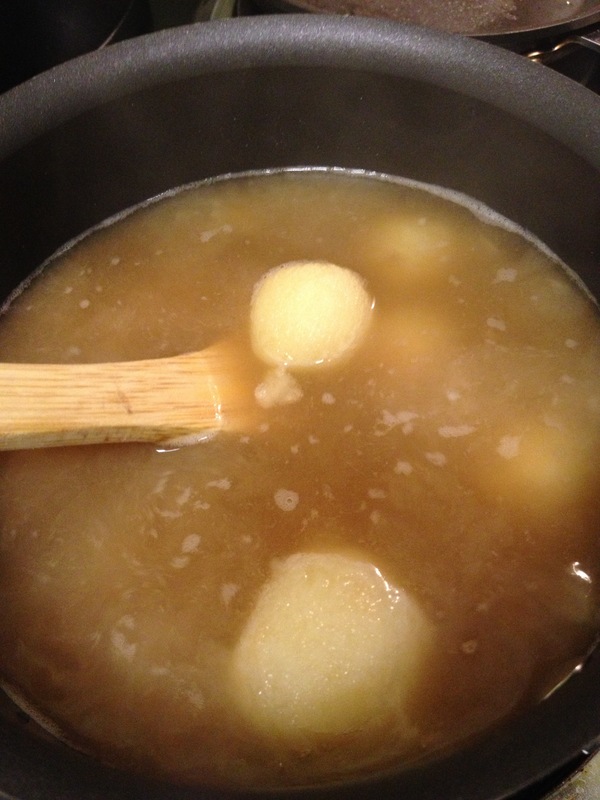 * if the broth is not quite thick enough, due to adding too much water, add tapioca, corn or arrowroot starch/ water mixture to thicken to your liking. I love organic cherries but they are expensive, here is a way to make a delicious fresh cherry dessert without breaking the bank! 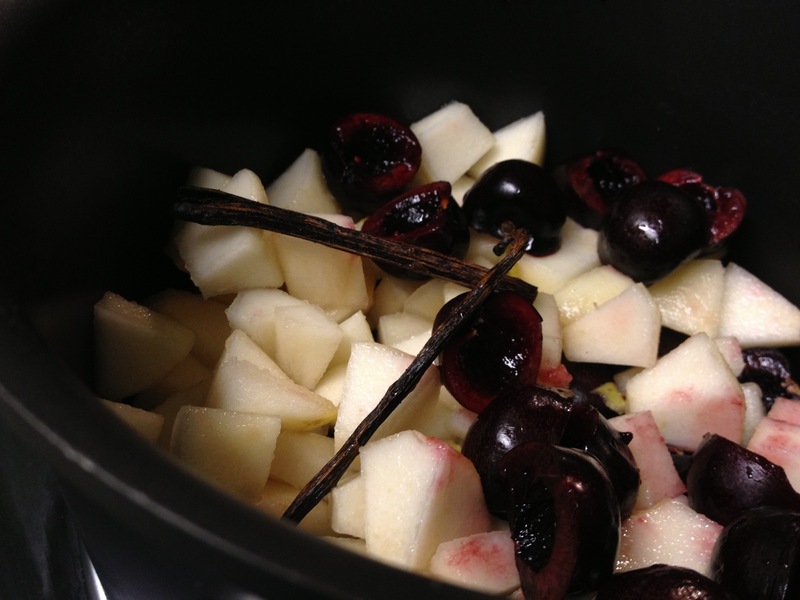 Pears are inexpensive and take on the flavor of the cherries as they cook down. Combine all of the filling ingredients in a medium sauce pan and cook over low/med heat stirring occasionally until thick. 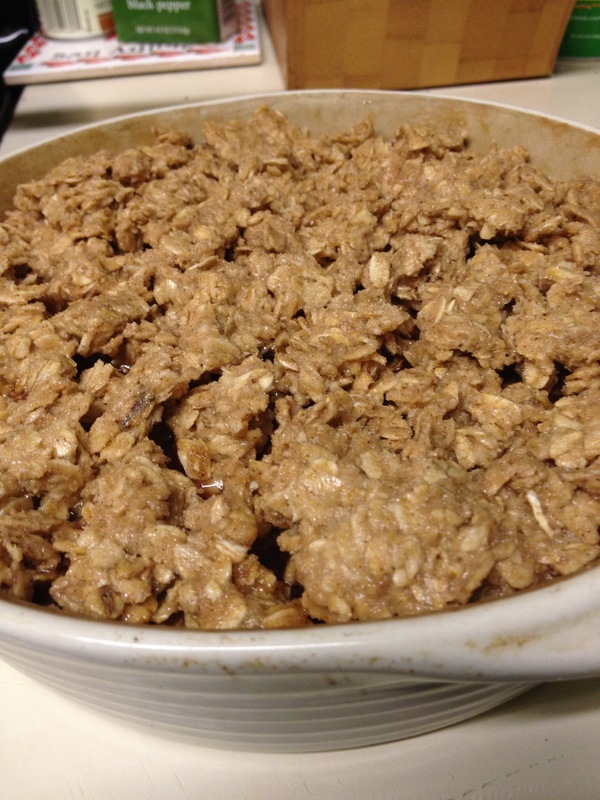 While filling is cooking down, mix all of the topping ingredients in a bowl. It should be slightly sticky but crumble easily by hand. Remove and discard vanilla bean from filling mixture. Pour into a small/medium baker or glass Pyrex dish. 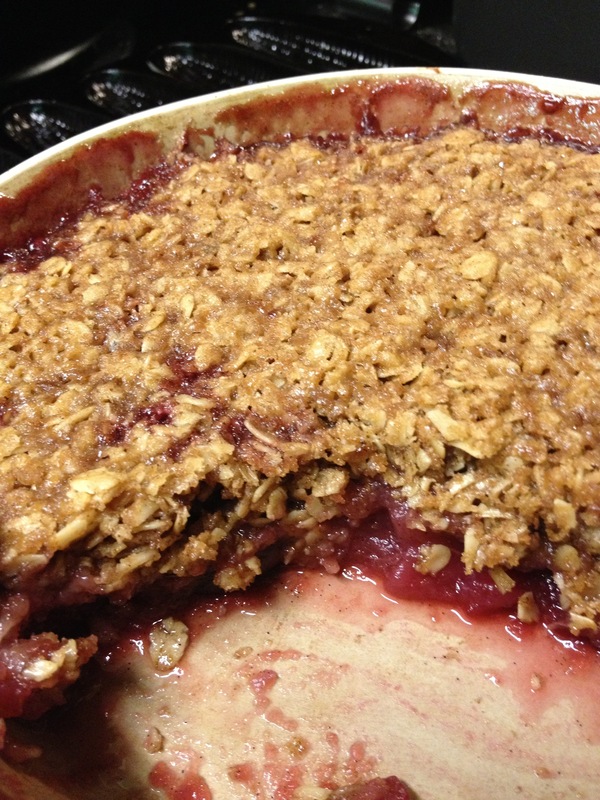 Crumble topping over the top of cherry filling and bake in the preheated oven for approximately 30 mins or until crust is crunchy. Here’s My Bag of Chicken Feet! 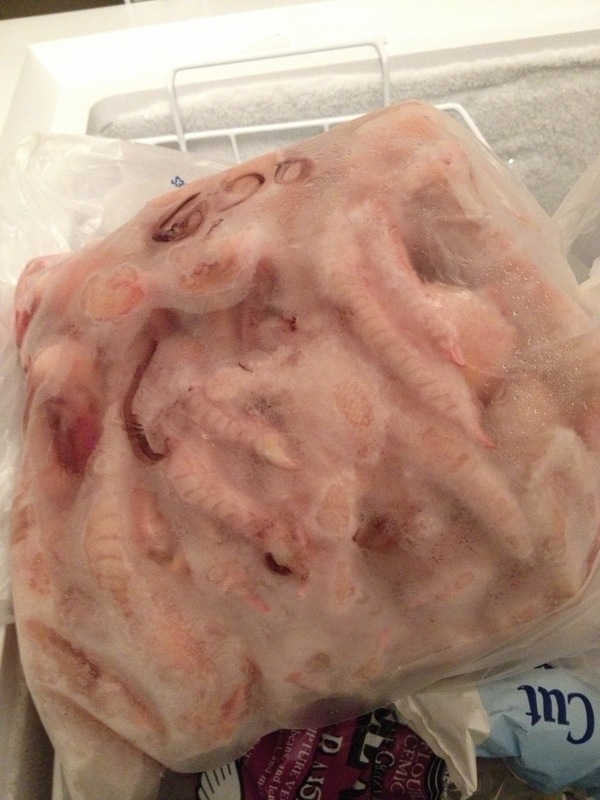 We had our monthly co-op gathering and this time I picked up a whole bag of chicken feet! For broth! Now you don’t have to use chicken feet in your broth if you do not wish, but I have heard from many that chicken feet make for a delicious rich broth. This will be my first time using them in my homemade chicken stock so wish me luck and I will keep you posted as to the results!